Cathodic Electro Deposited coating is used extensively in the automotive industry. In this process, the component after phosphate pre treatment is dipped in the bath of Ecoat chemicals and given an electric charge. The coating gets deposited on the component. The component is removed from the bath, washed and then baked. 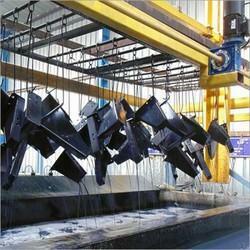 Powder coating is an older technology and used only in lower salt spray conditions. As of now we recommend customers to go for ED coating for most products – however if you have a specific application that requires powder coating technology we would be happy to provide the service. Clients can avail from us an astonishing range of CED Coating. These services are widely applied for coating on the various things. Our service range is highly appreciated for their high quality standards, durability and reliability. Clients can avail these high quality services at highly affordable prices from us. Our CED Coating Services are popular among various industry segments to increase the product life by protecting it from Rust. We offer our clients high grade C.E.D Coating services that are rendered by highly experienced professionals. C.E.D Coating is basically a Cathodic Electro Deposition System for automobile parts & components. This provides protection to automobile parts against various corrosion causing chemicals and enhances their service life. Kamal Envirotech supplies complete Electrocoat/CED Coating Ultrafilter systems.Ultrafiltration is a process for separating a portion of the low molecular weight component of the paint bath from the main paint stream.